Later topic: Please help with identifying this type. I have sevral items but NO Clue in what catagorey they belong? Any help? I’m pretty sure one is a printing press? I know one is a cutter but of what time period i have no clue? One is a paper compactor i think but the other NO CLUE? This looked like a great forum with intelligent and knowledgeable people any help would be appreciate and im up to sell them as well. Thank you! Should be a brass plate on the back with the model and serial #. Is there a second one next to it? Jump on that- it’s a fantastic press! Or, is it available? 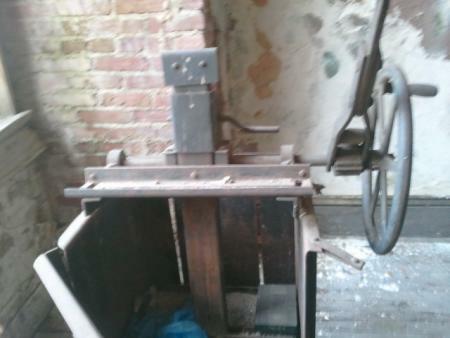 First is a cutter, the second appears to be two Thompson presses (I’m also interested in hearing more about these), then a foil or blocking press (gas or electric? ), then the last I am not sure. 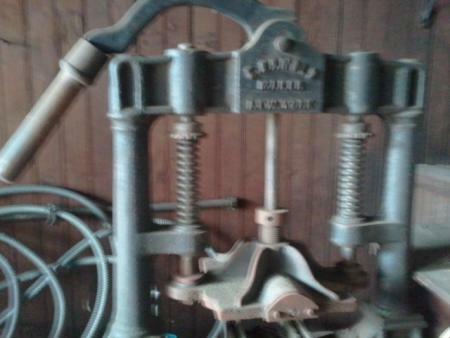 Cutter is an Oswego, and looks to be a good solid machine—with a spare blade it appears. The Thompson is a rare bird—but also heavier than all get out too. Behind the Thompsons on the wall you can see the inking rollers in a rack. Below it looks like the trucks or the roller blocks. All these parts are very important to the presses. Make sure they are not lost or separated from the machines if they are moved. The platens even have the belt shifter for overhead flatbelt drive. I’ve never seen that outside of books. 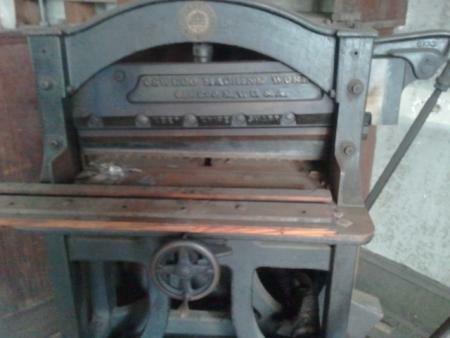 Most of the Gallys and Thomsons I’ve seen had the plaque on the front of the platen. Hm- my plaque is on the back. Best I can tell, mine is from around 1901, Quarto Medium. Bowerbox, what is the exact information on the plaque? Thomson (no “p”) is supposed to have purchased the press division at Colt’s in 1902. 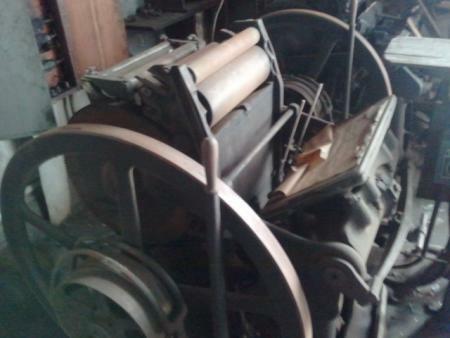 Gally, the originator, was also selling them at that time under his own name (as Gally Universal Printing Machines).